I feel you pain, got diagnosed with sleep apnea about eight years ago. I'm not making any judgements, but my doctor seemed like he really wanted me to be diagnosed with sleep Apnea a couple years ago. Pushed me hard to get tested. I just thought it was weird. I never went to get tested and he dropped it. I notice sometimes as I'm waking up, still very relaxed, I'll just take a real deep breath. I think that's normal - for me anyway. Subvet - I go to see the doc this Wednesday. Do you use one of those CPAC devices? I cannot imagine sleeping with that on my face. Kid - my mom has it also. I am thinking that if I lose weight that it will help. But those pounds just don't seem to want to come off. Hi there. I've been involved in sleep researcher for over 4 years and am now in graduate school to continue doing sleep research. I was looking for pictures about apnea to put in a presentation and stumbled on your blog. I decided to use pictures from the Mayo clinic instead of your picture of a guy wired up for his sleep study, but I thought I'd throw in my two cents. Sleep apnea can be pretty serious - leading to metabolic dysfunction, cardiac arrhythmia, immune dysfunction, depression, not to mention daytime sleepiness that can result in motor vehicle accidents. sig94 - there have been a lot of advances with CPAP devices and interfaces. They can be easy to tolerate, especially when you consider how much better it makes you feel. I have several family members and friends who refuse to sleep WITHOUT it because they feel so much better with it. Don't worry about becoming dependent though - if anything, your airway gets a little bit stronger (not a cure though). Also, regarding weight loss, if you have apnea and get a CPAP, you will probably find you have more energy to exercise. Also, apnea can adversely impact your body's levels of leptin and ghrelin, hormones that tell you when you're hungry or full and what kind of foods to crave (fatty, salty and sweet). Apnea can put your body into a constant state of stress, so it focuses on conserving resources (like storing food as fat). I think if you have apnea and use a CPAP all night every night, exercise, and change your diet, you may be able to both lose weight and cure your sleep problem! 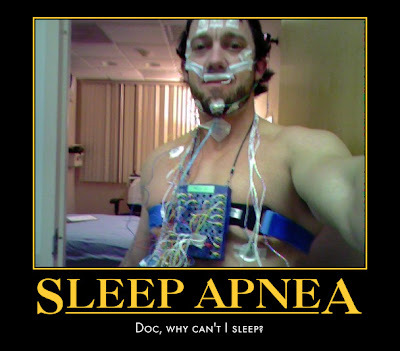 Keep in mind though, that weight is only one factor in sleep apnea. Size and shape of your airway makes a difference, as does innervation (connection of nerves from your brain) of the muscles that hold your airway open. Sleep student - thank you for your comment. Apparently my apnea is very positional. I had only eight episodes of apnea during 316 minutes of sleep, but seven of them ocurred during the five minutes I slept on my back. The Dr still recommends that I get a CPAC.